With Passover coming, everyone I know is scrambling for recipes and ideas. I don’t know about you, but when I think Passover, I think potatoes. And when I think of the day after Passover, I think about being intensely sick and tired of potatoes. And that’s why I think everyone celebrating passover can appreciate The No Potato Passover by Aviva Kanoff. Read what I thought of it, then enter below for one of two chances to win a copy! First I was all, “no way I want to go through an entire Passover without a potato.” But as I read through the cookbook, I was impressed with the idea. Sure I’m going to eat potatoes. But this book has some refreshing ideas of recipes that can supplement all those potatoes! When you first open the book the first thing you notice is how colorful and fun looking this book is. Every page has a colorful border and a picture (or two!) in addition to the recipe! This book has the full range of recipes, from salads, soups and sides, to mains including meat and poultry, and even dairy dishes. And of course dessert! All kosher for passover, and not a potato in sight! This book is colorful and fun looking, and features a picture for every recipe. What I liked about the recipes in this book is that they are simple, approachable and doable. This isn’t a book full of fancy recipes to look at and admire, but practical recipes to cook this Passover. In addition to the food photos in this book, there are a bunch of breathtakingly beautiful travel photos from around the world, taken by the author herself. They serve not only to visually enhance this book, but to take you with the author on a journey to new flavors, regions and cuisines. The lack of potatoes (and obviously grains) means that the book features lighter fare than your average Passover food, which is always a big bonus in my book. Roasted Butternut Squash Soup: I love butternut squash, and I love it in soup, but now I need to try it roasted in soup! 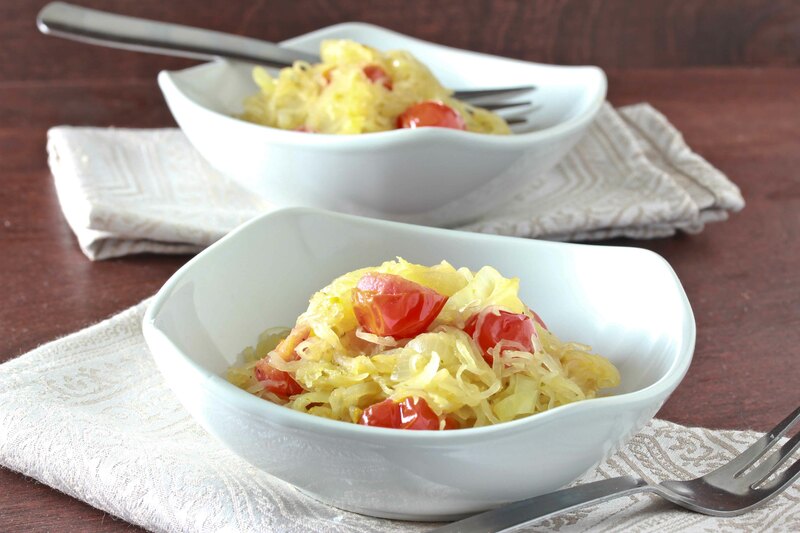 Salt and Pepper “Noodle” Kugel: made with spaghetti squash, so it’s lighter and healthier than regular noodle kugel! Cajun Carrot Fries: These look like sweet potato fries, but they are actually a veggie! Parsnip Mash: think mashed potatoes, but again – made with a vegetable! Add some sauteed onions and I am *in*! This is a fun cookbook and a great alternative for people who are making passover, and who’s customs allow for processed ingredients. Additionally, as this is a passover, the majority of the recipes in it are gluten free (with the exceptions of a couple of recipes which use matzah meal) so this is a great year round option for people who are gluten free. If your Passover customs don’t allow for processed ingredients from the stores, you will find that most of the recipes in this book won’t work for you. The book also relies on quinoa for many recipes, so if your customs don’t allow for that, many recipes in this book won’t be right for you. Firstly, as mentioned above, the book relies on a lot of ingredients that are processed and due to my family’s customs, off limits to me. I also found that a lot of recipes relied on store bought ingredients such as “imitation soy sauce” and “imitation mustard” or manischewitz boxed cake mix as a short cut instead of developing the flavors organically. Lastly, because I always discuss the photography in the books I review, I found the food photos in this book disappointing. While the travel photos are beautiful, the food pictures have a more amateur look to them, lending the book a less professional look than some others I have reviewed. This is a fun and colorful cookbook with great (and light!) alternatives to the standard heavy passover fare, and it’s a good option for people who are either gluten free or cooking for passover and have less restrictive customs. Want to win a copy? Scroll past the recipe for your chance to win one of TWO copies! Heat oil in a large frying pan. Add the onion slices and sautee on a medium flame until translucent. Add the minced garlic and sautee for an additional couple of minutes. Add the spaghetti squash, tomatoes and basil. Sautee for about 5-10 minutes. Add salt and pepper to taste. Serve hot. *To cook spaghetti squash: poke holes in it with a large knife, then place whole in a pan and bake at 350 for an hour to an hour and a half, until it’s tender when you pierce it with a fork. Allow to cool, then cut in half, scrape out the seeds, and shred. Entry #1 – Leave a comment on this post telling me what you like to eat on passover that doesn’t include any potatoes! Entry #6 – Follow Overtime Cook on Instagram and leave a comment on this post telling me that you did. Giveaway ends at 11:59 PM on Wednesday, March 20th. A valid email address or twitter profile must be provided. Prize can be shipped within the USA. Giveaway is sponsored by the author. Disclaimer: I was provided with a review copy of this book, but all opinions are my own. There are affiliate links within this post. This page contains affiliate link(s), which means that if you buy anything through the links, a small portion of the sale will benefit me and help with this blog’s expenses. I make gefilte fish from scratch, only for pesach – no potatoes there! Also carrot muffins & matza onion kugel & apple crisp. Shoot. I love potatoes. But one thing I make that doesn’t include them is matzah brei. It isn’t Pesach without it. No potatoes includes potato starch, I assume. Well, the meat and soups sound interesting. I think that’s everything. I better win this Miriam. Hi Miriam! I like candy and desserts! I follow you on Facebook and Instagram! I would love to win a new cookbook! Chag sameach! Oh and I get your emails! I love to eat roasted veggies! I try to focus on salads and soups (w/o potatoes! ), and generally keep potatoes to a minimum. Roasted veggies sounds like a bonus. I receive your emails. Love finding them first thing in the morning! Thanks! I’m on a diet and I cant have potatoes! I really need a cookbook without potatoes! 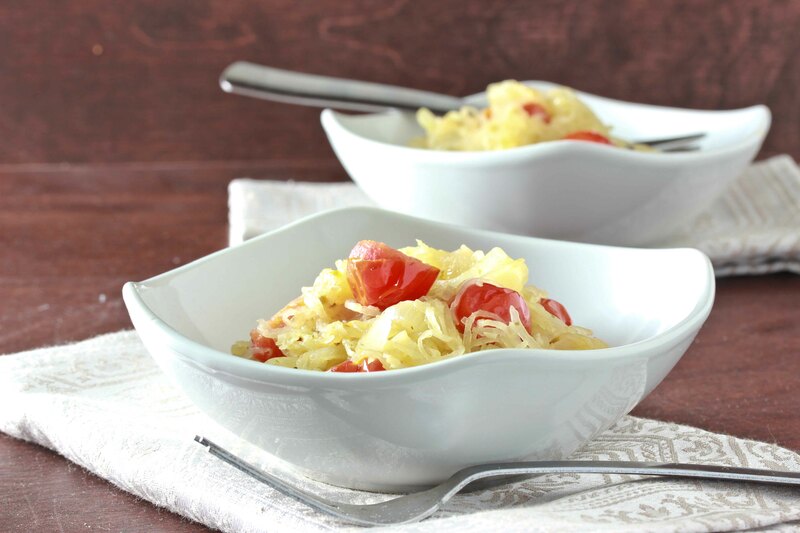 mmmm i love, love, love spaghetti squash! As for what I like to eat on Passover? Deviled Eggs! No potatoes? – luckily for me, I can have matza brie! 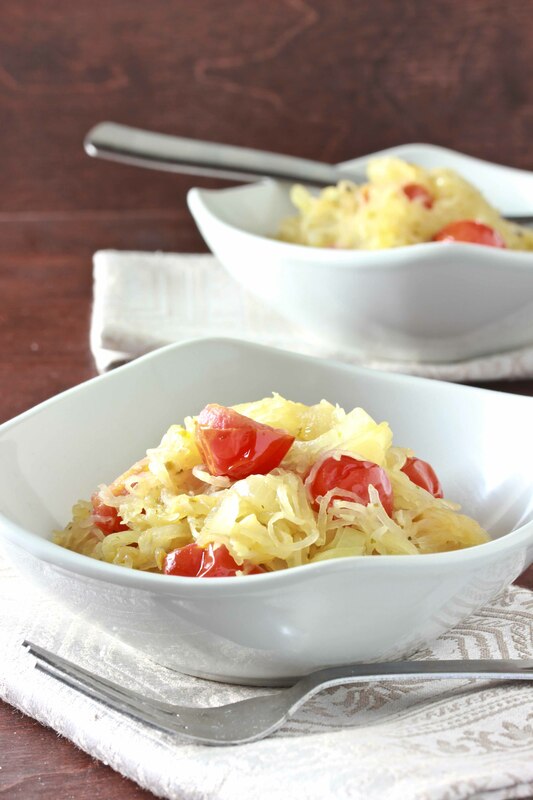 I love spaghetti squash/apple kugel. soo good!! I get your email updates.. what would I do without them?! On pesach the only things I enjoy without potatoes are meatballs, guacamole, and fruit slushies. I have an old recipe from Mishpacha for spinach kugelettes. They are my low-fat, low-calorie go to recipe! Love! Tales of an overtime cook on fb! I love a good fresh salad with a fresh squeezed citrus juice dressing! I eat even more salad than usual on Pesach! Oddly enough, my favourite recipe for Passover is deviled eggs. Not that it’s traditional, but a much beloved friend used to make them every year – so they remind me of her. Honestly, this book is ideal. I had no idea a book like this existed. My husband is allergic to potatoes and every year I accidentally kill him because the last ingredient of SOMETHING (cake, cereal etc) will be potato flakes. I have had to get inventive. I mostly make salads, matzoh brie, sweet potato kugel, fish. But I have to avoid almost everything they sell in the store, but matzoh. Thanks for sharing this recipe! it looks great. You’re an incredible photographer too. I already follow you on twitter ! One thing we have every year on Pesach, with out a doubt, are homemade rolls. I get your emails and follow on facebook..
already follow your blog always and liked your group on facebook. Love desert on pesach. Btw I have been following your blog since you started. I love the way you write and how down to earth you seem to be! Please dont stop! I eat a good fresh salad with “no potatoes” in it. I subscribe to you via RSS feed! I just joined to add my name on email. I love my mother’s Pesach sponge cake; it’s actually better than the one she makes with flour! And no potato starch in hers. And I follow this blog on facebook. Anything chocolate! I follow on Pinterest. Anything chocolate! Follow on Pinterest. I’m pretty sure I’ve already liked your page on Facebook but if I haven’t, I will as soon as I finish posting my comments here. My favorite Pesach dish is a zucchini kugel. onions, zucchini, oil, matzo meal (we eat gebrokts) and I think salt and pepper. Very simple ingredients, but very good. I use very few potatoes on Pesach , but also very few “imitation” products, so I find the idea of this cookbook intriguing but possibly not completely useful. Hi, we usually start every meal with a huge fresh salad, and then we have a another kind of veg salad + a veg side dish at each meal to counteract all that matzah, so I eat lots of veg of all different kinds over Pesach. We especially eat lots of zuchinni, made all different ways. liked you on facebook, love your reviews! no pinterest or instagram, but I’ll follow u on Facebook. favorite non potato Pesach food would be home-made chunky applesauce! Can’t wait to try the recipes for Passover!! Thanks for the great recipes. I appreciate it so much!! Hi liked the page on Pinterest!!! Its not a pesach-specific food but there is nothing like chicken soup with knaidelach at the seder! I like having a fruity salad of avocado,mango, red onion and jicama. I follow you on facebook and pinterest and I receive your newsletters. I know follow you on instagram too. we love my vanilla pudding cake!!! i love to make matza brei on pesach!!!! I liked you on FB and I LOVE your stuff in the magazines. I hope to have time to make almond butter cups. CAn I use store bought almond butter? BTW. On FB my email account is frishfruit@gmail, and the company is Fruit Platters and More. But the best way to reach me is the frishmanfamily@gmail.com address. I really hope I win! I like pineapple kugel, mushroom onion quiche, fish balls and brownie fudge cake :)).. I’ve already like you on FB..
sweet and sour salmon and matzah lasagna!